When you run an LS engine, performance begins with the introduction of air into the intake manifold. 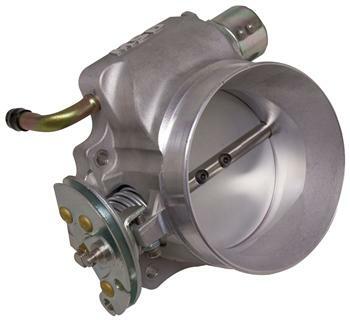 MSD’s new 90mm LS Throttle Body answers the need for a high quality throttle body with a cable driven throttle mechanism that bolts to most factory and aftermarket intakes. MSD invested the time and resources to develop a cast throttle body assembly in order to achieve a unique parabolic bore form. This design helps deliver excellent driveability characteristics during part throttle that typical billet straight bore throttles just can’t deliver. We incorporated factory style bearings and seals on the throttle blade to achieve a very robust design that can withstand temperature swings seen in street applications.